Tickets Tags are a powerful way of labeling and grouping tickets. These can also be used to queue/filters conditions, automation workflows and generating reports. 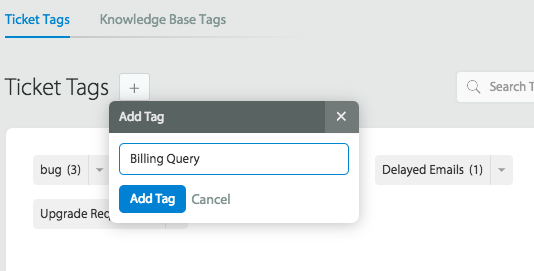 Navigate to “Manage >> Tags” module under the module switcher. Note: Only agents with “Manage Tags” permission can view this section. 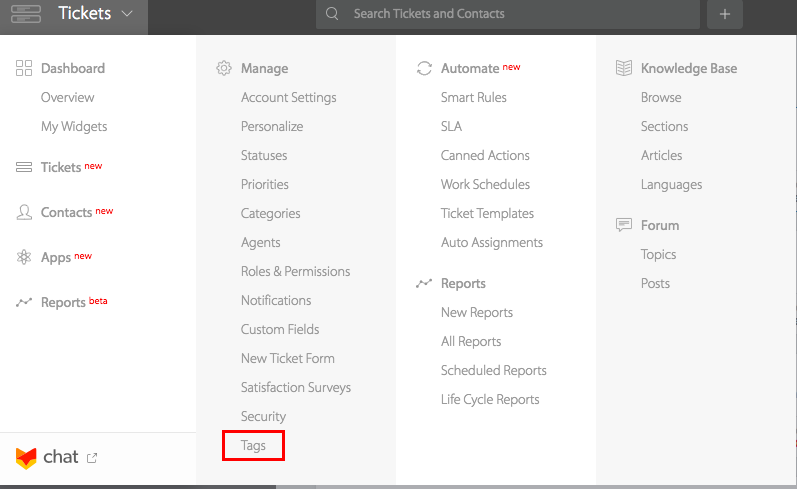 To create a new ticket tag, navigate to “Ticket Tags” tab and click on the “+” button. You can now start tagging tickets with this tag. Note: To know how to add a tag to a ticket from ticket detail page, refer to this article. Once the tag is created, it is added to the list of available tags. Clicking on the tag shows list of articles which has the tag applied. (Number) next to the name shows the no. of articles tagged. Rename: Lets you rename the tag. 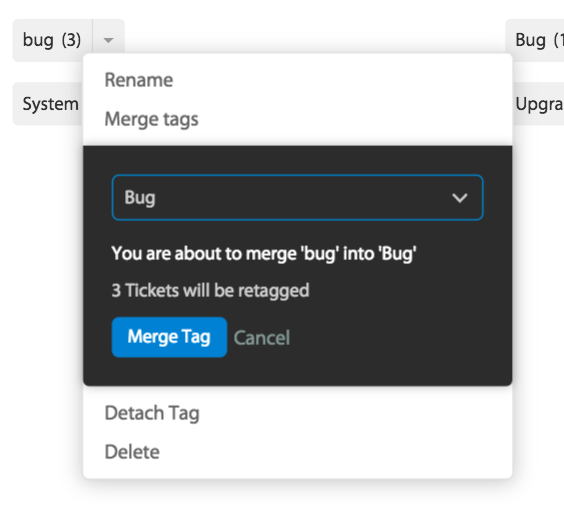 Merge: Merge the tag to an existing tag. Detach: Detach the tag from desired set of tickets. Delete: Deletes the tag from the app. Clicking on the tag name will take you to the ticket list page with the “Tag” filter applied. For scenarios where there are accidentally typo mistakes, renaming tags comes in handy to solve this issue. Click on the “Rename” option displayed under the more action section. Rename the tag to the desired name and click on “Update Tag” to save it . 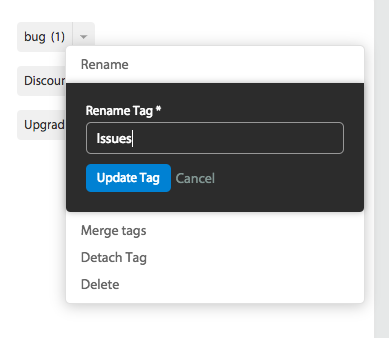 In the above example, the tag “bug” was renamed to “Issues”. Now all the existing tickets related to “bug” will have the updated tag name “Issues”. When you have created duplicate tags and want combine them, you can use “Merge tags”. Tickets from the merge looser tags will be retagged to merge winner tag name (This should be the tag you want to dissolve by merging with another tag). 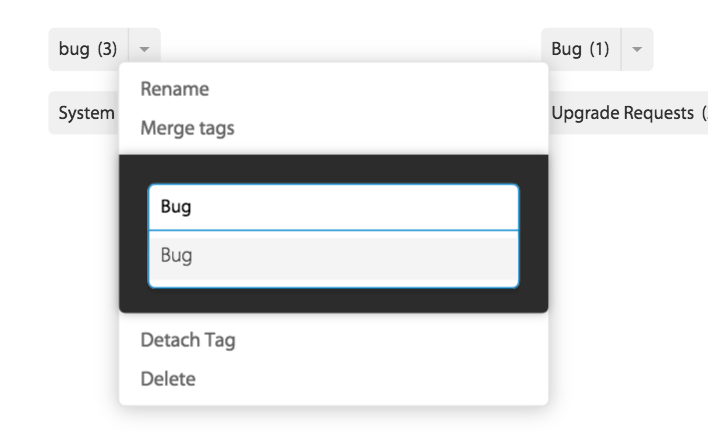 Click on the “Merge Tags” from more actions. Search for the tag which you want to merge this tag. On “Merge Tag” all the tag you have initiated the “Merge Tag” from will get merged to the selected tag. Detach tag helps agent to remove a tag from one or more tickets. Click on “Detach Tag” from more actions. List of all the tickets related to this tag will be displayed as shown below. Agent can choose the desired/all tickets from this list and click on “Detach Tag”. 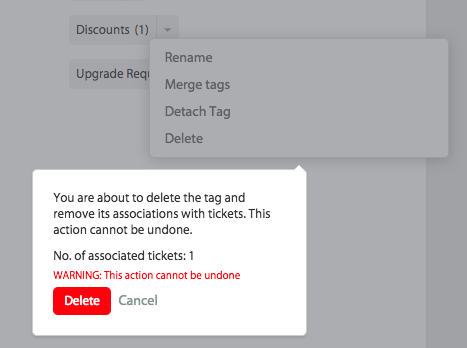 On detach, the tag will be removed from the selected tickets. Deleting a tag will remove the tag from the ticketing system and will no longer be available for ticket tagging. Click on the “Delete” option from the more action. Confirm your action to proceed further. Deleting a tag will remove this tag from the existing tickets as well.